In part one of this post we discussed some of the issues arising from Yolande Knell’s filmed and audio reports titled “Death at the Junction” which were broadcast on BBC World News television and on BBC Radio 4 on April 23rd. In November 2014 the PLO put out a ‘media advisory’ document instructing foreign journalists to use the term “Al Aqsa Mosque compound” instead of what was described as the “inaccurate term” Temple Mount. That directive is of course part and parcel of the PLO’s habitual negation of Jewish history and the BBC – which used to use the term ‘Haram al Sharif’ – has since frequently been found complying with that attempt to promote the inaccurate notion that the whole of Temple Mount “forms the Mosque” and amplifying baseless Palestinian claims of alleged Israeli intentions to change the status quo at the site. Knell fails to tell audiences that Izz al-Din Abu Shakhadam’s accomplice had served a 16-month prison term in Israel for Hamas activities and that Hamas issued death notices for them both. Making no effort to relieve viewers of the inaccurate impressions given by those false statements, Knell goes on to showcase another terrorist who carried out a car-ramming attack on March 4th. Viewers see the following unchallenged claim in the sub-titles translating an interviewee’s response to Knell’s question concerning the knife. That false theme has been repeatedly seen during recent months and it is part of the incitement spread by Palestinian Authority officials. Viewers of this programme are not however informed of that crucial context before Knell goes on to show a gory display. Both the Palestinian Authority and Hamas do not share Knell’s uncertainty with regard to the circumstances which brought about the death of the ‘martyr’ as she was termed in the PA president’s condolence letter to her family. Like the other lies highlighted above, that too goes unchallenged by Yolande Knell. Both the half-hour long film and the radio report presented an opportunity for Knell to provide BBC audiences with more wide-ranging background and context than news reports on the terror attacks which have plagued Israel for over half a year allow. Instead, the corporation’s funding public was fed politicised messaging by means of the use of terminology such as “Palestinian land” and “illegal” settlements, undiluted PLO propaganda and downright lies which went entirely unchallenged by a journalist supposedly committed to accurate and impartial reporting. With ‘usually’ meaning what typically or normally happens, it is worth taking a closer look at that claim from Adie. The Meir Amit Intelligence and Terrorism Information Center produced an overview the seven months of violence between mid-September 2015 and mid-April 2016 which does not support Adie’s use of the term ‘usually’ or her employment of the qualifier “Israel says”. “Two hundred forty terrorists were involved in the 204 significant terrorist attacks, that is, most of the attacks were carried out by single attackers. In addition, at least 59 terrorists were detained during preventive activities, so that the total number of terrorists who carried out or planned to carry out terrorist attacks was at least 299. Of the 240 terrorists who carried out significant terrorist attacks, 138 were killed during the attacks. Two were killed in “work accidents” (one in a car crash and one when an IED blew up in his hands). One hundred and two terrorists were apprehended and detained while carrying out attacks, or escaped. Was the Gush Etzion junction really “previously peaceful”? In fact numerous fatal and non-fatal terror attacks have been perpetrated at that location over the years. Revealingly, Knell does not provide any explanation – or logical legal argument – to support her claim that communities built on land purchased by Jews and then belligerently occupied by the invading Jordanian army for a period of 19 years are now “illegal”. As ever, audiences are not informed that the interpretation of ‘international law’ adopted and promoted by the BBC is contradicted by additional legal opinions or that past peace proposals have included Gush Etzion in areas which would remain under Israeli control. Knell makes no effort to contribute to her audiences’ understanding of the factors – including Ottoman land laws – which form the basis for land classification in Judea & Samaria and neither does she inform them of the 1979 Israeli government decision according to which new communities in Judea & Samaria would be constructed exclusively on state land, the resulting land surveys intended to prevent construction on land privately owned by Palestinians or of the fact that under the terms of the Oslo Accords, Israel is responsible for zoning and planning in Area C – which includes Gush Etzion. Instead, Knell dumbs down the picture presented to listeners and viewers of these reports by use of the inaccurate, misleading – and politicised – term “Palestinian land”. Knell refrains from clarifying to her audiences where “here” is exactly and fails to prevent confusion by informing audiences that the vast majority of Palestinian towns and villages in Gush Etzion are located in Area A or Area B – meaning that their requests for planning permission and building permits are submitted to the Palestinian Authority. Khirbat Zachariah (also Sakariya) is indeed located in Area C and hence falls under Civil Administration planning laws but Knell’s report does not include any mention of the help Saad and his fellow villagers have received on that front from their neighbours in Gush Etzion. BBC audiences are not told that the residents of Khirbat Zachariah were originally tenant farmers who rented land from an Arab Christian family from Bethlehem. The land was sold to a subsidiary company of the Jewish National Fund in 1944 before the family emigrated to America and when one resident of the Khirbat Zachariah claimed ownership of the land after the Jordanian occupation of the area in 1948, he lost the case in a Jordanian court and subsequently, in 1980, his claim of ownership of the land was also rejected by the Israeli High Court of Justice. Additional aspects of Knell’s reports will be discussed in part two of this post. 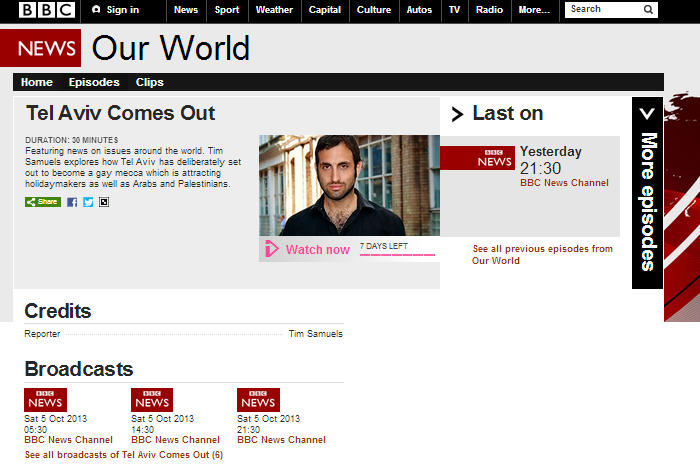 Readers may remember that back in August we noted that a BBC World Service radio programme on the subject of Tel Aviv’s Gay Pride Week included – inter alia – inaccuracies attributable to the fact that the programme makers had not bothered to amend it to reflect developments in the investigation into the 2009 shooting at the Bar Noar youth centre. At the time, we noted that a filmed version of the programme was also scheduled for broadcast. The television version of the documentary appeared on October 5th in the programme ‘Our World‘ on the BBC News Channel. Unfortunately, as can be seen in this version of the filmed programme (also available on iPlayer for a limited period of time for those in the UK), the Bar Noar shootings are still being misrepresented as an anti-gay hate crime and the political associations of Professor Aeyal Gross are still not being made clear to BBC audiences, in clear breach of editorial guidelines.